Accidents happen, especially during sports. While it may be possible to limit the number and severity of injuries with prevention strategies, one wrong step or a collision on the field can result in a sudden and painful injury. When this happens, you need to be prepared to act quickly. Ideally, you will have access to a well-stocked first aid kit or have medical help nearby. With an acute injury, it's usually obvious what caused the injury. Nonetheless, determining the exact cause of the injury is an important part of making quick treatment decisions. The first treatment for most acute soft tissue injuries (bruises, strains, sprains, and tears) is to prevent, stop, and reduce swelling. When soft tissue is damaged, it swells or possibly bleeds internally. This swelling causes pain and loss of motion, which limits the use of the muscles. The primary treatment to stop swelling of injured soft tissue is with the RICE method. This acronym makes it easy to remember the steps you need to take when treating the injury: Protection, Rest, Ice, Compression, Elevation. It's also known as RICE, which does not include "protection," though that is an important step. Protection: In this case, protection means stopping activity immediately and protecting the injured part from additional damage. Rest: Rest the area to allow the tissues time to heal. Ice: Applying cold therapy (ice or an ice pack wrapped in a thin towel) to an acute injury reduces swelling and pain. Ice is a vaso-constrictor. It causes the blood vessels to narrow and limits internal bleeding at the injury site. Apply cold to the affected area every two hours for no more than 20 minutes at a time. Allow the skin temperature to return to normal before icing it again. You can ice an acute injury several times a day for up to three days. Compression: Compression of an acute injury is perhaps the next most important immediate treatment tip. By quickly wrapping the injured body part with an elastic bandage or wrap, you help keep swelling to a minimum. If possible, it's helpful to apply ice to the injured area over the compression wrap to limit the swelling. Elevation: Elevating the injured area is another way to reduce the blood flow and swelling to the area. Wrap the injured part in a compression bandage. Apply ice to the injured part (use a bag of crushed ice or a bag of frozen vegetables, if needed) for 10 minutes to 15 minutes. Let the area warm completely before applying ice again (to prevent frostbite). Elevate the injured part to reduce swelling. Get to a physician for a proper diagnosis of any serious injury. If the injury causes a cut or abrasion that leads to bleeding, it's important to stop the blood flow quickly. Wash the wound with soap and water, and apply an appropriate bandage until medical help arrives. A deep cut will probably require stitches. However, if you can pull the edges of the cut together, you may be able to use a butterfly bandage to hold it closed. While the most dramatic sports injuries are acute and sudden, the majority of sports injuries come on gradually and result in vague aches and pains. The chronic pain of overuse injuries, such as tendonitis, tends to have subtle or vague symptoms that develop slowly. What begins as a small, nagging ache or pain can grow into a debilitating injury if it isn't recognized and treated early. Treating overuse injuries requires rest and reducing exercise intensity, frequency, and duration. 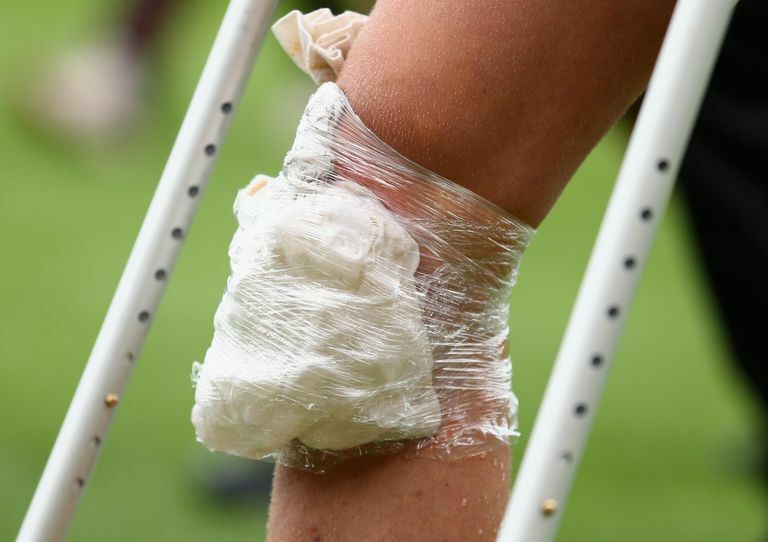 Icing an overuse injury can also help reduce inflammation and pain. For more serious overuse injuries, physical therapy, over-the-counter (OTC) medications, and complete rest may be necessary. After you've treated your injury, what comes next? Most athletes want to know how soon they can return to their sport. This answer tends to be different for everyone because each athlete and each injury is unique. Returning to sports too soon can increase your risk of re-injury or developing a chronic problem that will lead to a longer recovery. Waiting too long, however, can lead to unnecessary fitness declines (deconditioning). Treating any injury right away is important, so it is good to review all of these common first aid methods regularly to refresh your memory. That way, you'll be prepared and know what to do just in case something happens.